Find huge deals in Ishikawa, Japan that you may book now & pay later! Best prices for in Ishikawa, Japan. A dream vacation for you and your family, guaranteed by our travel consultants. For members-only deals, we recommend using the new filter for deals in Ishikawa, Japan. This lovely hotel is in Kaga. The establishment consists of 17 rooms. Communal areas are wheelchair accessible at Beniya Mukayu. Those who dislike animals may enjoy their stay, as this accommodation does not allow pets. Travellers arriving by car may leave their vehicle at the accommodation's parking spaces. We proudly serve carefully selected and cooked fresh seafood from Japan sea. It is located in the center of town and good to stroll about. 'Warmth of trees and Tenderness of leaves' is our theme of serving gently. Two grand baths each for gentlemen and ladies, saunas, outdoor baths and other baths. This comfortable hotel is in Kaga. No pets are allowed on the premises. Can enjoy relaxing mood natural to hot spring fully at various taste of five chartered open-air bath,large open air hot bath 'Yakushimaru hot water'. After bath care-beauty salon treatments,reflexology treatments fully equipped. 4 guest room type with open air hot bath etc. Meal provided at room basically.Supper is seasonal Japanese style dinner tray from Hokuriku area. Only one hot spring in Yamashiro proud of hot water quantity.Hope you enjoy pure hot spring of this rich hot water and hearty welcome of staff person. Taste Japanese style dinner tray cooked by head chef with sincere hospitality from seasonal products. Accommodation of new construction renovation . 'Yu House' was completed it renovation of May 2003. Open-air bath with rooms , all 20 rooms . Building of Heisei.Yamashiro hot spring and gourmet cuisine as hospitality. This comfortable hotel is located in Nanao. The total number of rooms is 125. Those who dislike animals may enjoy their stay, as this property does not allow pets. This lovely hotel is in Kaga. 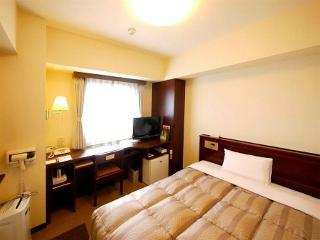 APA Hotel Kagadaishoji-Ekimae features a total of 136 accommodation units. Those who dislike animals may enjoy their stay, as this accommodation does not allow pets. This comfortable hotel can be found in Nanao. Tadaya is not a pet-friendly establishment. 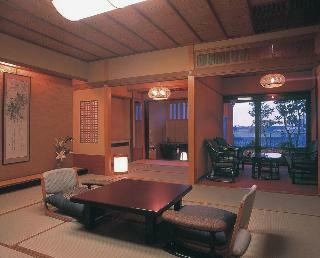 It is a functional and tasteful cottage-style (Sukiyazukuri) Japanese ryokan on a scenic site facing calm Nanao Bay. Our grand bath Shinju buro or Pearl Bath comes from the image of the mysterious colour and the roundness of pearl."" We have a new Hot Spring zone since April 2004. Please enjoy 18 different kinds of baths in three grand baths and outdoor baths. 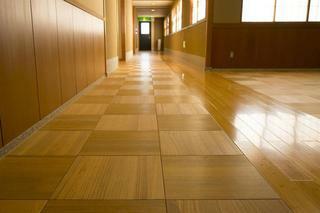 Wooden made carpet will enhance the atmosphere inside the hotel. Mini concert will be held in the period 21:00-22:00. This comfortable hotel is set in Yamanaka. Pets are not permitted on the premises. 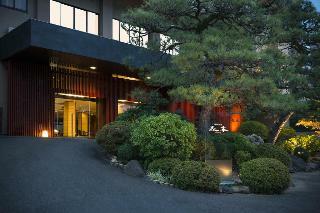 This 3 star hotel is located within the city of Kaga. This charming hotel is in Kaga. This is not a pet-friendly hotel. This comfortable hotel is situated in Yamanaka. Those who dislike animals may enjoy their stay, as this accommodation does not allow pets. This comfortable hotel is situated in Yamashiro. Pets are not allowed at Midorinoyado Banshokaku. We are the typical Japanese style inn of long standing. The inn is surrounded by the beautiful garden and also we have very new clean buildings, as well. Please enjoy our several hot spring baths and the superb KAISEKI cuisine with fresh sea foods from the sea of Japan. This charming hotel is in Awazu. 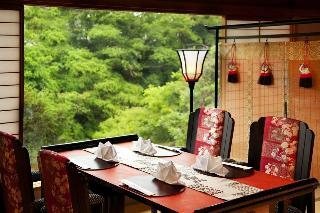 It is an old established ryokan located in the center of town and on the lake at the same time. The grand bath with an outdoor bath shows the superb view of the Shibayama-gata lake which looks different seven times a day and the Hakusan mountain range. Please try our Shochu Bar with a large assortment of 80 kinds of imo-jochu. This charming hotel is located in Nanao. This hotel is a super-resport built in the city of Kaga prefecture. 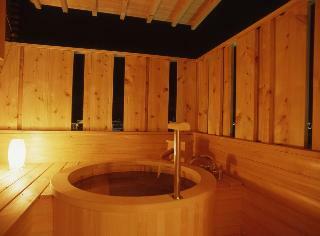 Our facilities focus on relaxation with incredible views of Hakusan Mountains, and natural hot springs. It is located on the heights of Higashiyama at the foot of a scenic beauty, Banshou-en garden. Please enjoy trying our baths of spacious and tasteful grand bath and an outdoor bath with a sauna in the greens. 15 minutes by car from Kaga I.C. on Hokuriku Expressway. This comfortable hotel is located in Yamanaka. This comfortable hotel is set in Yamanaka. About 25 minutes by car from Kaga-Onsen Station, minutes by car from Komatsu Airport. 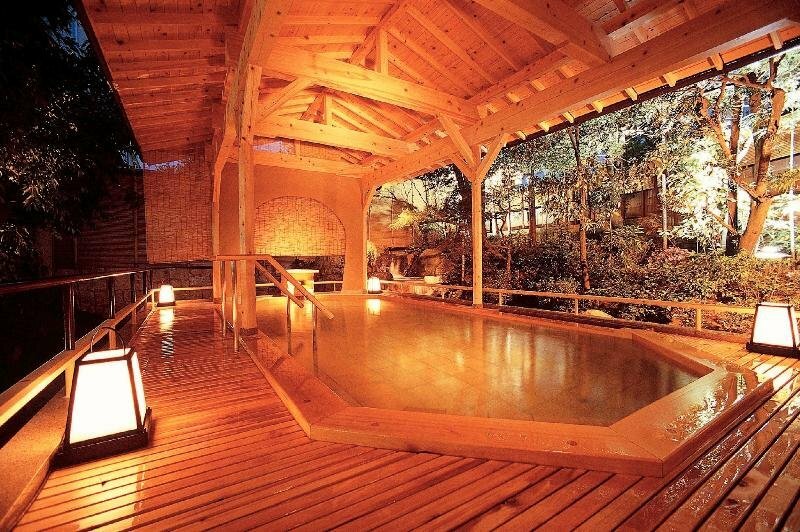 This hotel is set up a mansion in the mountains hot spring in the Kaga hot spring village. Hot spring that contains sulfate Izumi (weak alkaline) also with thermal effect. Hardly to get cold type of hot spring. Public baths and after enjoying the open-air bath, please enjoy to your heart's content creative buffet with used of the local four seasons metarial. Tsujinoya Hananosho has a vast Japanese garden and cherry tree and wsasanqua camellia are coloring to the rich nature in season. The hotel provides the traditional and noble spacious rooms, open-air bath in the rich nature and main bath covered the wall with skillful Kutani pottery. 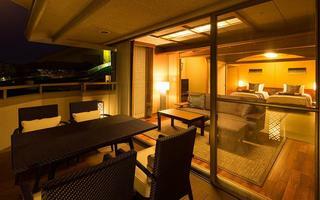 It has a view of magnificent Japan sea from its guest rooms, lobby and grand bath. Best facilities in Oku Noto region. Gojinjo-daiko drumming show is held every evening and guests can experience the festival in Noto. We serve dishes full of fresh seafood from Japan sea. Courtesy bus to and from famous Wajima morning market. Hot spring in the outskirts with 3Km from Wajima city. Place for accommodate about 100. Renovated with tatami matting, Japanese paper and lacquer. 300 kinds of the Yukata for choosing. This lovely hotel is in Wajima. 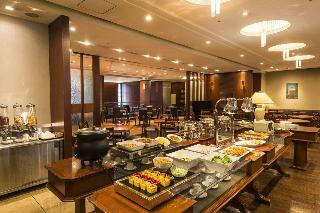 It is popular with women and businessmen as the adjacent annex of Kanazawa New Grand Hotel. Such as Kenrokuen Garden and Kanazawa Castle Park Popular attractions and shopping area downtown Korinbo and Omicho market is within walking distance. It is very convenient as a base for sightseeing. This comfortable hotel is in Kaga. This comfortable hotel is in Yamanaka. This lovely hotel is situated in Yamanaka. 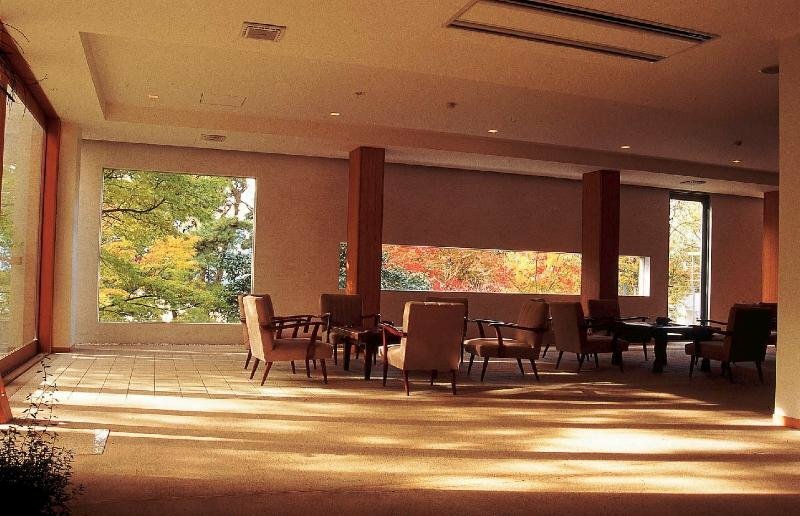 This lovely hotel is set in Yamanaka. This unpretentious hotel can be found in Kaga. This simple hotel can be found in Kaga. This lovely hotel is set in Kaga. This lovely hotel can be found in Wakura. This simple hotel is situated in Kaga.